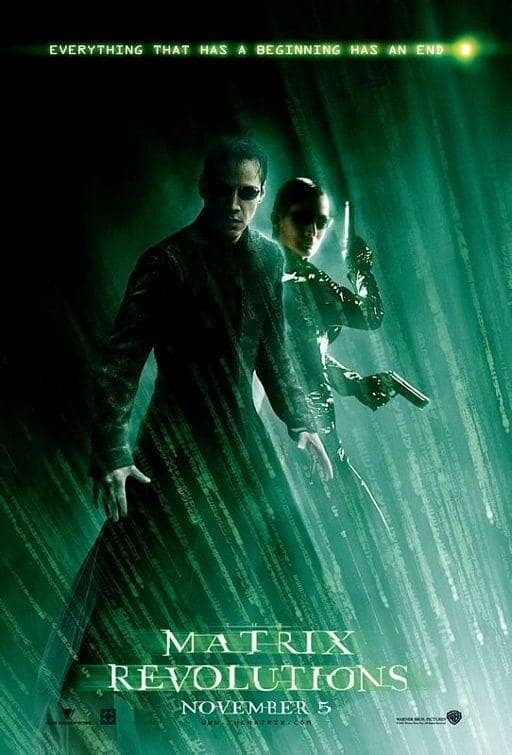 One of the many Matrix Revolutions movie posters. The third and final installment of The Matrix trilogy. Agent Smith: Why, Mr. Anderson? Why do you do it? Why get up? Why keep fighting? Do you believe you're fighting for something? For more that your survival? Can you tell me what it is? Do you even know? Is it freedom? Or truth? Perhaps peace? Yes? No? Could it be for love? Illusions, Mr. Anderson. Vagaries of perception. The temporary constructs of a feeble human intellect trying desperately to justify an existence that is without meaning or purpose. And all of them as artificial as the Matrix itself, although only a human mind could invent something as insipid as love. You must be able to see it, Mr. Anderson. You must know it by now. You can't win. It's pointless to keep fighting. Why, Mr. Anderson? Why? Why do you persist? Agent Smith: Mr. Anderson. Welcome back, we missed you. Agent Smith: Like what I've done with the place? Agent Smith: I know it does, I've seen it. That's why the rest of me is just going to enjoy the show because we already know that I'm the one that beats you.